Article published on 25 September 2015 by Ravinder Randhawa. 1 Comment. Day 1… day 2… day 27… day 90… day 118… day 174… day 200… day 253…. proceeding one after another, impossible numbers delivering both relief and pain, telling their tale of suffering, endurance and sacrifice. Cataloguing the body’s drawn out deterioration, the protracted anguish of its shrinking and shrivelling; the flesh thinning, the bones jutting out, the face becoming hollow and drawn. This is what a continuous and sustained hunger strike looks like. Both appalling in its agony and awe-inspiring in its fortitude and endurance. In this particular case, profoundly powerful for the fact that it’s being undertaken by an 82 year old man. 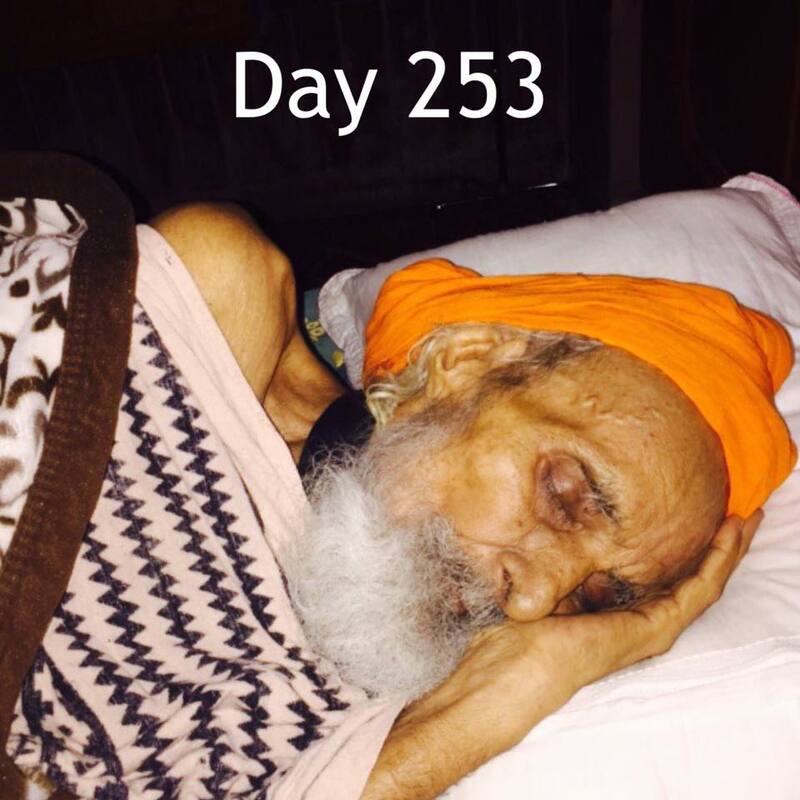 In India, Punjab, on 16th January 2015 Surat Singh Khalsa, respectfully known as Bapu Surat Singh began a hunger strike. In July he also gave up water. By 25th September 2015 he’d been fasting for 253 days. It’s been reported that he was arrested three times and force-fed. In addition, his village has been surrounded by police, his son arrested at one point and his son-in-law murdered in mysterious circumstances. It’s astonishing to note that numerous hunger strikes are in progress around the world, in an age where we would expect political systems and governments to be developed, evolved and responsive; to hold themselves accountable to their voters, abiding by the decisions of the courts and working with due process. In Bahrain, the well-known academic and blogger, Dr Abduljalil Al-Singace, who has worked for human rights for many years, was arrested when participating in the peaceful Arab Spring of 2011. He was subjected to torture and ill-treatment, including forced standing, verbal and sexual assault, beatings and prolonged solitary confinement. In March 2015 Dr Al-Singace, who refuses to wear a prison uniform, commenced a hunger strike to protest against poor and insanitary conditions including the violence that occurred at Jau Prison on 10th March. Dr Al-Singace suffers from several medical conditions and in April collapsed and was taken to hospital where he is on an intravenous drip but continuing with his hunger strike. Irom Chanu Sharmila, known as the ‘Iron Lady of Manipur’ has been called the ‘longest hunger striker,’ having begun her hunger strike in November 2000 after what is known as the ‘Malom Massacre’ when ten civilians were shot and killed while waiting at a bus stop, allegedly by the Assam Rifles. Irom Sharmila’s main demand is that the Indian government repeal the Armed Forces (Special Powers) Act, generally known as the AFSPA. She has refused food and water, but has survived because of force-feeding. Amnesty International has declared her a ‘prisoner of conscience’ and in 2014, on International Women’s Day she was voted the top woman icon of India in an MSN poll. Other hunger strikes are occurring across the world, by individuals or groups. Going on hunger strike or fasting, is one of the oldest forms of peaceful protest. In ancient times the protester would fast upon the threshold of the person from whom justice was sought. In Ireland, in 1923, almost 8,000 anti-treaty prisoners went on hunger strike. A hunger strike is a moral crusade, conducted in a moral manner, where no violence, threats or retaliation are issued. The burden of this moral crusade is borne entirely by the hunger-striker. The protest is non-violent, the damage and suffering are individual and willingly chosen. The objective is often to benefit others, to support a cause or to uphold a principle. Through suffering, determination and will-power a hunger strike demonstrates the integrity and morality of the person who is fasting; conferring nobility and dignity upon their cause and thereby elevating it. Regarded as perhaps, the greatest example of Mind over Matter, a sustained fast becomes a riveting, tensely unfolding drama, magnetising attention and engaging people’s hearts and minds. A story that builds and grows from day to day, combining hope, fear and tragedy. The fast becomes a conversation with the world, and the state, even if the state pretends not to be listening. The longer a fast continues, the greater the moral impact; invoking others to examine their own consciences. The hunger striker and the cause become one. Support begins to gather and gain momentum; social media begins to chatter, campaigns evolve, petitions are set up, poems written, songs sung, art created and public events organised. The hunger striker embeds the principle that his or her own death is connected to larger principles of human connectedness and responsibility. Force Feeding is how governments often react – accusing the hunger striker of attempting to commit suicide and imposing force-feeding. A government will have made careful calculations about the public relations effect and their moral image if the hunger striker dies. They become afraid that the hunger striker will be seen as a martyr and turned into myth and legend. “It is utterly impossible to describe the anguish of it,” wrote the journalist Djuna Barnes in 1914, about force-feeding. Both hunger strikers and suicide bombers willingly sacrifice their life and body on behalf of a cause; they have a passionate desire to right wrongs and fight injustice. Both see themselves as belonging to a wider society, are imbued with a sense of human connectedness, and both aim to engineer change and benefit others through their sacrifice. But their methods are profoundly, ethically and dangerously different. Where the hunger striker imposes punishment only upon themselves, the suicide bomber imposes punishment, death and destruction on all those within range: the young and old, the able and disabled, workplaces, homes and personal property. The hunger-striker suffers from day to day, indefinitely and progressively. The suicide bomber suffers one devastating moment of annihilation. The hunger striker seeks to have his or her demands met peacefully. The suicide bomber seeks to have his or her demands met through inflicting violence, terror and pain. The hunger striker seeks justice but not revenge. The suicide bomber seeks justice and revenge, often fuelled by hatred and anger, specifically aiming to inflict indiscriminate harm and suffering, without, it appears, any desire to break the vicious cycle of destruction and death. The hunger striker is prepared to engage in dialogue and discussion, placing a high value on words, reason, logic, perseverance, respect for the self and others. The suicide bomber gives the highest value to violence, placing it above intelligence, human empathy, reason, the rights of others, mercy and compassion. There is a great deal of difference in the aims and methods of hunger strikers and the aims and methods of force feeding. For example the american method in Guantanamo which is directed against someone struggling against force feeding involves complete incapacitation of the human being. So they end up existing strapped to a chair with a hole for them to defecate through. Their tongue is also immobilized to prevent their biting it off. In legal terms they have withdrawn both permission and consent. And there are many forms of force feeding some involving naso-gastric intubation some more old school and more violent. I am Sharmila’s fiancee so I do not share any great desire for her premature death which is unfortunately the agenda of various neo-fascist groups that run the prisons police and human rights NGOs in manipur. What she seeks is to widen the support for her cause. There are ways to do this and if you were to read up on the current ethic tensions in Manipur you could see how this could be done and why it is being prevented. But back to her case. So called Activists who tend to operate in shoals governed by group think seem to think she has been campaigning for the repeal of IPC 309 and the ending of detention and force feeding. What she is campaigning for is the removal of the AFSPA. This is not even anti-Indian Army. Many in Manipur would prefer the presence of either the Indian Army or extra-State Police Personnel because the local police are formed of drug dealers, criminals and the wayward children of the ruling classes. I have seen Sharmila being force fed. There is no violence or hatred in it. She does not resist. I have seen and experienced more violent hate filled attempts at force feeding. There is an agenda in grouping all these together even if it be only laziness and lack of academic rigour. I have tried and failed to reach out to the famliy of Bapu Surat Singh Khalsa their methodologies being similar. But the curse of Indian Minority groups is that they will not unite for any purpose. Minorities are the Majority in India. But they remain as powerless as crabs in a bucket.